In Part I of this series I have written about arm positioning principles (腕法, わんほう, wanhō, i.e., the way the arm is utilized while holding a brush). 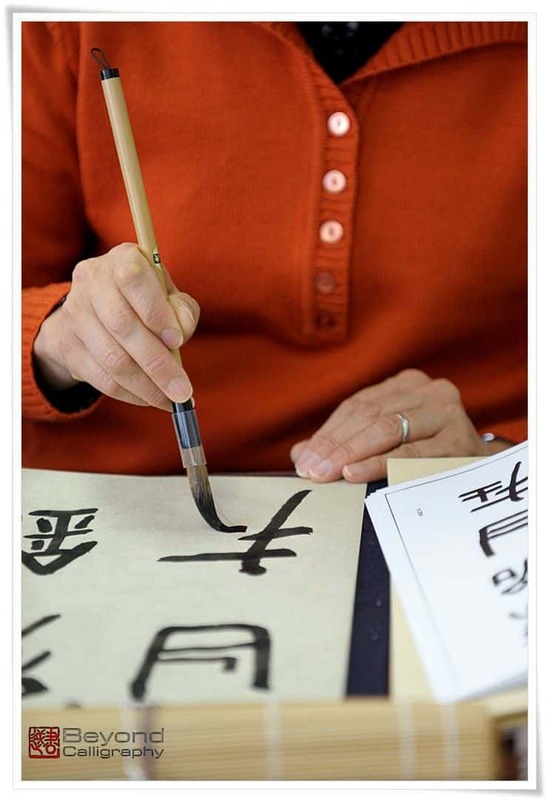 I also wrote that they are often confused with brush holding principles (執筆法, しっぴつほう, shippitsu hō, i.e., the position of fingers on the brush axis). In this article I will focus on the latter in connection with the former. Calligraphers use various kinds and sizes of brushes, and each of them serves a certain purpose. Although this article will not detail how or why one chooses a particular brush, the way in which the brush is held with the fingers depends either upon the choice of brush or a personal preference. Figure 1. In this picture you can see possibly the most common variation of the pair grip method (双鉤法, そうこうほう, sōkō hō). The pair grip method (双鉤法, そうこうほう, sōkō hō), Figure 1. The simple grip method (単鉤法, たんこうほう, tankō hō), Figure 2. The pair grip method is suitable for large and medium sized brushes, whereas the simple grip method is used for small brushes. In the pair grip method, the brush axis is held between the thumb, and the index finger merges with the middle finger (first pair), supported from underneath by the ring finger and the small finger (second pair). The wrist is bent upwards and the palm is curved upwards forming an open space inside it (see also Figure 1 shown in Part I of this article here). In this way, the brush can be easily controlled by the fingers rather than the wrist, although the wrist should not be immobilised. Fingers ought to hold the brush firmly. To paraphrase an old Chinese saying, the fingers should hold the brush like a sword, the wrist should be as supple as water. This rule applies to virtually any brush holding technique. The simple grip method suggests holding a brush between the thumb and the index finger, using the other fingers for support. Although this method is very suitable for the pillow arm technique (枕腕法, ちんわんほう, chinwan hō) and the bucket arm technique (提腕法, ていわんほう, teiwan hō), it is not imperative. Figure 2. This picture was taken a year ago, during a small New Year party of my fellow calligraphers. One of the Masters uses a long spoon, showing a variation of the simple grip method (単鉤法, たんこうほう, tankō hō). This particular one is popular for writing Japanese kana (かな). Both methods can be used regardless of the size of the characters, though the pair grip method is preferable for larger characters. Depending upon the style, the height of the grip on the brush axis will change. For instance, when writing in standard script (楷書, かいしょ, kaisho), one should hold the brush closer to the tuft for greater control. 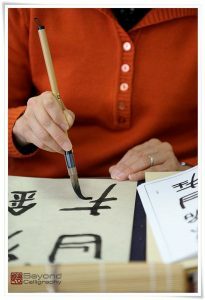 When writing in semi-cursive script, the fingers will hold the hikkan (筆管, ひっかん, lit. “brush tube / pipe”, i.e “brush handle”) in its middle part. Lastly, to ensure the greatest mobility, while writing in cursive script the brush should be held near the top part of the brush axis. Yet, this is a personal preference. For instance, I often practice standard script while holding the brush at the end of the handle in order to raise the level of difficulty and practice my control of the brush tip. 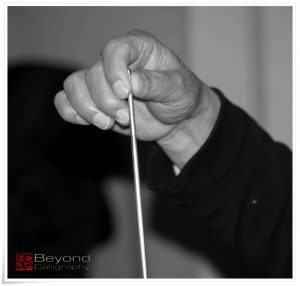 While writing with the suspended arm technique (懸腕法, けんわんほう, kenwan hō), the brush movement should come from the shoulder, not from the wrist or fingers. For this reason, writing this way is the most challenging, especially in smaller scale calligraphy where each micro movement of our body will have a huge impact on the brush tip. Regardless of the method, the brush should be held perpendicularly (or nearly) to the paper surface, and the wrist bent upwards, resembling the raised head of a bird, with the palm being the head and the fingers being the pointing beak.